Some of the dishes from my pop up dinner. What’s up foodies? 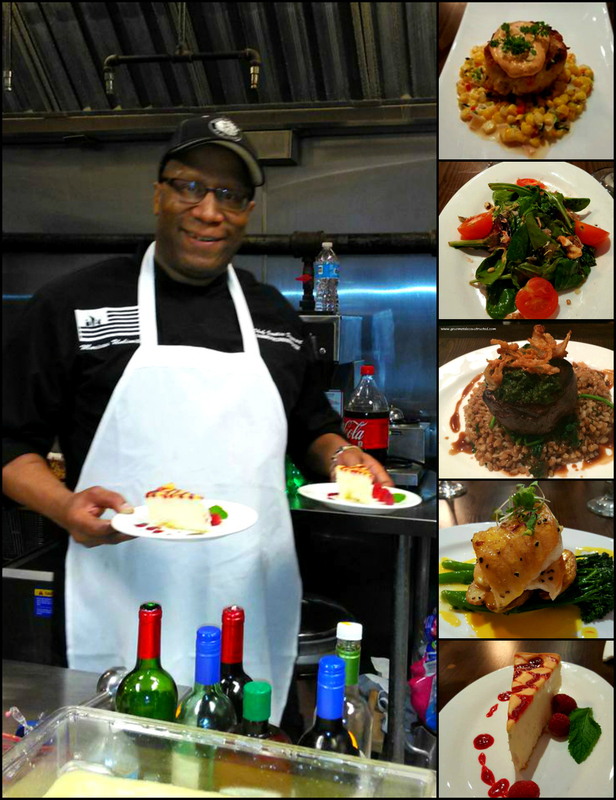 First I would like to thank those of you who attended my first pop-up dinner at Clemenza’s Restaurant in Queens, NY. The event was sold out, the guest were great, and the food was magnificent. I look forward to doing this more often at different locations. I will keep you all posted! Now today’s recipe features an ingredient that is not very common here in the United States… Camel meat! If you have been following me, you know that I love cooking all types of exotic foods. A month ago my good friend Anshu Pathak, who is the owner of Exotic Meat Market in California asked me if I would be interested in trying camel meat. I was a little apprehensive at first, then I thought to myself, what the heck?, people eat it in other countries all the time. Camel meat is still eaten in certain regions, including Eritrea, Somalia, Djibouti, Saudi Arabia, Egypt, Syria, Libya, Sudan, Ethiopia, Kazakhstan, and other arid regions where alternative forms of protein may be limited or where camel meat has had a long cultural history. I accepted his offer and he informed me that he will send me “Camel Short Ribs”. Camel ribs going into the sous vide bath! When my package arrived I was very excited to see what they looked like, and the one thing I noticed was the flesh side had a thick cap of fat covering the meat. Also they were quite large for “short ribs”. I then reached out to Anshu for advice on which cooking method should I use to get the best results. He gave me a warning that this cut of meat is very tough and should be cooked a long time, such as braising them. I decided to give them a long and slow cook in a Sous Vide bath. I would set the temperature to 133F degrees and let them rock out for about 72 hours, so they’d be done in time for Sunday dinner. I will also leave the cap of fat on the ribs during the process to help flavor the meat, and trim whatever is left before finishing them. Since camel is eaten in many of the middle eastern countries I’m sticking to that theme by using spices common in that region. I decided to make a BBQ sauce with the complex flavors of north Africa and the middle east. 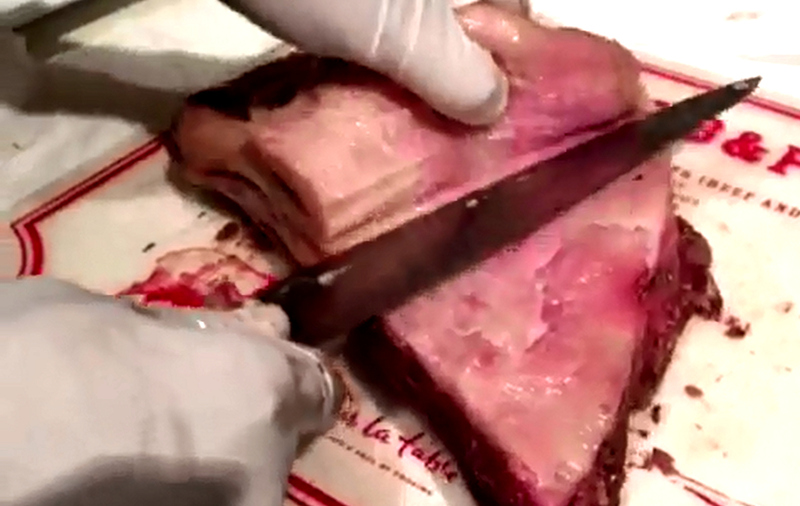 Removing the fat from the cooked ribs. The end result was some of the best tasting ribs I have ever eaten. All of the tough tendons broke down and the meat tender. I did remove the remaining fat before searing the ribs. The only thing I missed was a little silverskin (membrane) on the bone side, but my kitchen torch fixed that problem in no time! The BBQ glaze was sweet and savory and ended up being a great choice for the flavor profile. In my opinion it resembled beef, and Emily said it reminded her of pork ribs, hmmm. I served these ribs with cumin-spiced spinach (recipe below), Basmati rice, and fresh Naan. Enjoy! (As an alternative to camel this same recipe is great for beef ribs as well.) UPDATE : Sous Vide Cookbook will be released late 2018, it’s now available for preorder at in the links below after the recipe. 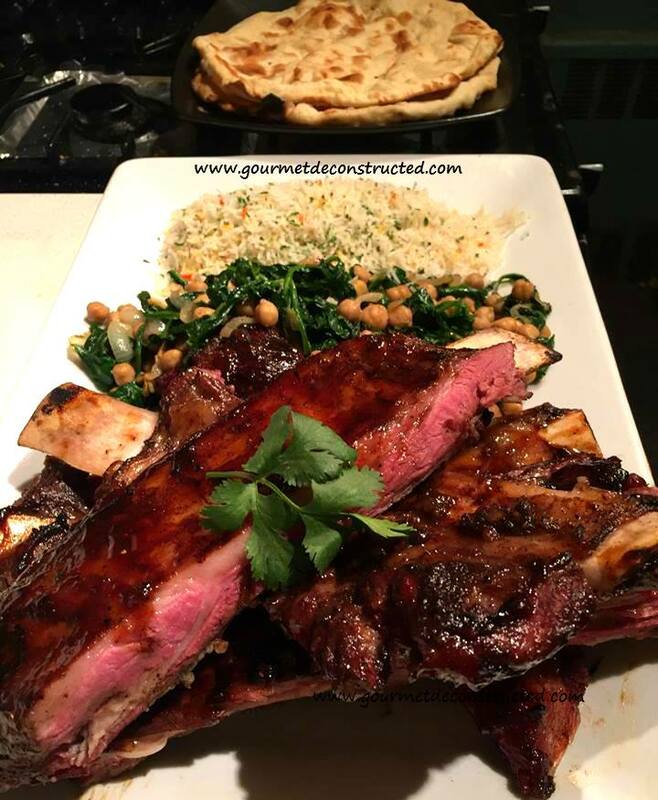 Middle eastern-style BBQ Camel ribs , cumin-spiced spinach w/chickpeas, basmati rice, and fresh naan! Put the camel ribs, spices and olive oil into the bags and then vacuum seal. 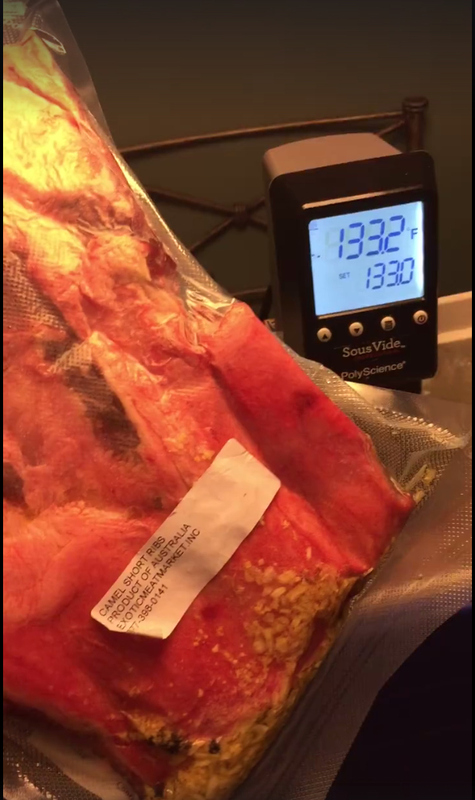 When your sous vide bath hits 133F degrees drop you bags in and set your timer to 72 hours. Be sure to check on them every now and then and add warm water if there is too much evaporation. Before you remove the bags from the water prepare the BBQ sauce. 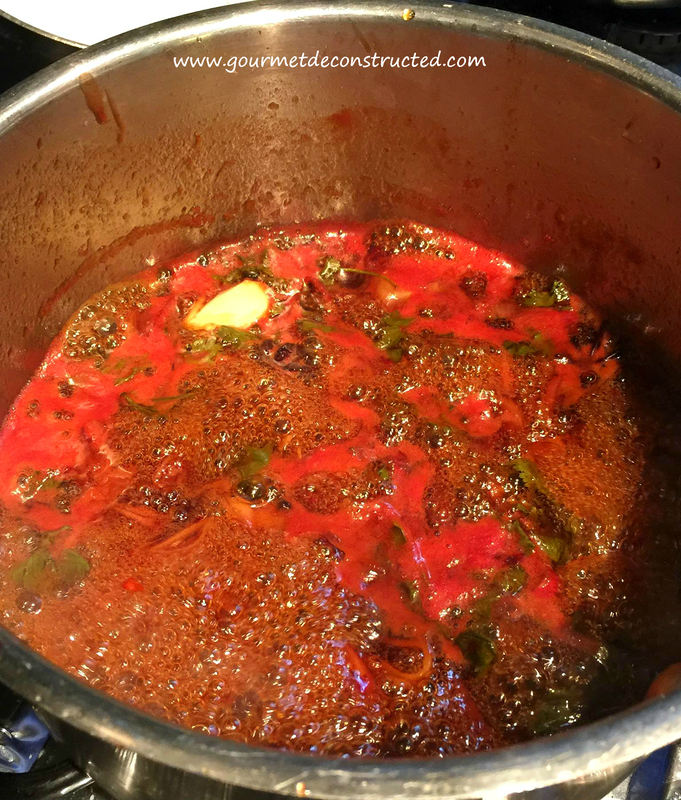 Bring all of ingredients to a simmer over medium-high heat; cook, whisking occasionally, until sauce is reduced to about 1 cup and has thickened, about 15 minutes. Pour through a fine strainer into a bowl. 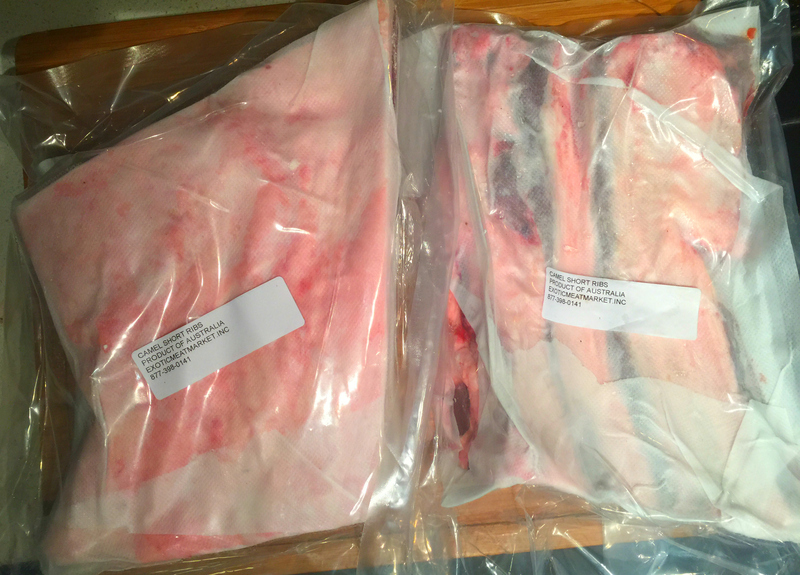 Remove the ribs from the bags, and in the case of camel ribs use a sharp knife to remove the excess fat and use paper towels to dry the meat before finishing. In a large cast iron skillet, or other heavy bottomed pan, heat up 2 tablespoons of oil until it is smoking hot and sear your ribs on all sides until a nice crust forms. You can then use a brush to glaze the ribs with BBQ sauce and serve with Naan, rice, and side of your choice. Bon Appetit! Posted on May 3, 2016, in Foodie Road Trips & Other Fun Things, sous vide, Wild Game and tagged BBQ, camel meat, chick peas, cilantro, cumin, middle eastern food, north african food, sous vide, spinach, wild game meats, wildgame. Bookmark the permalink. 6 Comments.